In some communities, if you know someone who knows somebody, or are a writer, you show up in the local classroom and talk about your work. Not so in Newton, Massachusetts. 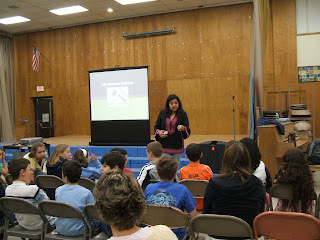 Yesterday, I showcased a presentation called "RICKSHAW GIRL and ALPANA ART" to sixty or so parent volunteers. Newton Public Schools' Creative Arts Director Cheryl Nelson (who has served in this capacity for 21 years) invited me to be a "surprise" guest during their annual celebratory brunch. Basically, I'll say yes to anything this talented, experienced woman asks me to do in the schools, even though I'd much rather address a cavernous auditorium of kids than a cozy living room of adults. Grownups make me nervous; kids don't. But I owe a lot to Ms. Nelson. Five years ago she got me started by previewing my LIFE BETWEEN CULTURES presentation for the fourth grade immigration unit. It wasn't very good back then. But her insightful suggestions helped me make changes that (1) engage boys as well as girls, (2) connect with my audience's five senses, and (3) reach different kinds of learners. How many authors get that kind of professional feedback (for free!) from a person who knows kids, teachers, and curriculum, and has watched countless presentations? When she thought I was ready, Cheryl invited parents to preview my show. Once they gave the green light, I was listed along with other artists and writers in Newton's Blue Binder. Creative Arts and Sciences Committee members leaf through the binder to book enrichment programs for their schools. They evaluate performances rigorously, balance their chunk of the PTO budget, and listen to educators as they plan a year of programming. Cheryl sends me their feedback so I can keep improving my shows. This is serious stuff. If I'm discussing an author visit in other towns, I'm glad to casually drop this bomb somewhere in the conversation: "Yes, I'm in the Newton Blue Binder." Believe me, they're impressed. Authors, if we want to get invited into the classroom, our primary goal can't be promoting or selling our books. It takes time to design a program that adds value to the teachers and enriches the curriculum. If you're up for that goal, why not invite an experienced educator to help? But be ready for criticism like: "That part's a bit boring." Or, "You're leaving out a certain group of kids." There's no getting around it: revision skills and a thick skin are required for every part of this profession.